As a farmer, it is easy to fall into the daily grind and get comfortable. When you’re trying to start seeds, till new ground or finish harvesting before the rains come the farm is all-consuming. In farming, quality family time is often time spent in the field with your kids and spouse working on the never-ending list of chores. You’re regularly making sacrifices. Attending a child’s soccer game is out of the question at the height of harvest season. It’s difficult enough keeping the ocean of responsibilities at bay, let alone taking on more. And yet there is more we must consider taking on. Senator Mike McGuire and flower farmer Lane DeVries during a recent tour of Sun Valley Floral Farm in Arcata. Senator Mike McGuire (right, red tie) with his colleagues in the Senate who supported his resolution to recognize June as California Grown Flower Month. declaring June as California Grown Flower Month. Last year was a very difficult legislative year for California agriculture. The Assembly and Senate made decisions that have been detrimental to California agriculture’s ability to compete, and remarks were made during debates that farmers won’t soon forget. It’s more important than ever for farmers to sow relationships with their representatives on every level, highlighting the value they bring to their communities and the impact they make on the economy. Thank you to Senator McGuire for taking the time to visit one of our flower farmers and for your support for California agriculture, and kudos to Lane and Sun Valley for making the effort to host the visit. These relationship-building opportunities do make a difference. Each year, the CCFC works with our farms and the team at Florists Review to publish an annual farm and flower guide that’s distributed in the June issues of Florists Review and Super Floral Magazine. The botanical look of our new online directory is based off of our annual Farm and Flower Guide. This guide has been a tremendous resource for wholesalers, designers and floral educators who seek out and count on the updated information, design ideas and farm profiles. A survey of readers was recently done and the response was amazing. Respondents told us that they’d like to see the guide twice a year! We won’t be going that far, but the enthusiasm and support for the publication is appreciated and highlights the value it brings to the readers and the industry. The new directory will be both beautiful and functional for helping people find the farm and flowers they are looking for. 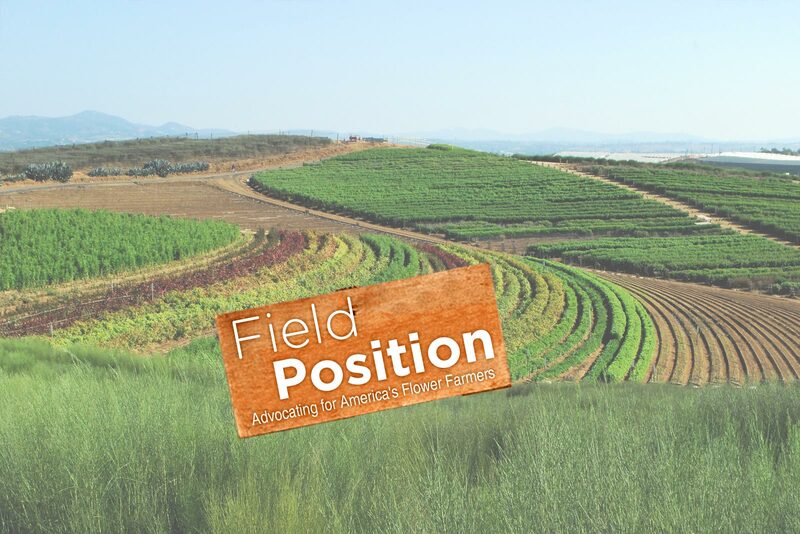 The added benefit of this year’s California Farm & Flower guide project will be the relationship it will have to our redesigned website at ccfc.org. A redesign of the Commission’s website is underway and the flowers directory we see in the annual California Farm & Flower Guide will be the same flowers we use in the online digital directory. So, if you’d like to see your flowers featured on our newly designed website and in the 2017 Farm & Flower Guide, be sure to become a supporter by sponsoring the new guide. The team at Florists Review will be contacting each of our farms for support and sponsorship. June will be here before we know it, so make sure you’re in on this great opportunity to feature your farm and flowers. Lisa Strydom and Teresa Salts with Florists Review will be contacting farms, but don’t wait! Be proactive and contact them directly today. Last weekend, I took my son down to the Nimbus Dam to show him something I hope he remembers forever. I wanted him to see the water roaring through the dam near our house. The water situation in Northern California has become pretty extreme, with the situation in Oroville making national news. So, to go to our nearby dam to see just how high the river has risen was pretty incredible. We were looking at a river that wasn’t just climbing its banks, but was climbing what were previously seen as sheer cliffs. The spot where people typically fished for salmon below the dam appeared to be 20 to 30 feet below surface now. Of course, all of this water is good for California. Chris Beytes of GrowerTalks published a piece highlighting how quickly things have turned around here in California, saying, “What a difference a year makes.” It certainly has. Check out these “before and after” drought monitoring maps. The imagery is pretty self-explanatory. Red is bad, etc., etc. You can see here the year-over-year position of the state, and then what it looked like in November of last year. The change is dramatic. Heavy rains and wind expected for Santa Barbara area. And the rain just keeps coming. More rain is expected hit Northern California starting on Thursday, and then Friday for Southern California. In fact, there are weather warnings in the Santa Barbara area indicating heavy rain and high winds. Coincidentally, that’s right where that little spec of red remains on the map. Charizma Mendoza, a student at California State Polytechnic University, Pomona, was recently selected to intern with the Commission during the spring semester. Charizma is an agribusiness and food industry management major and in her senior year. She was also a member of the 2016 Agriculture Leadership Class, where I first met her while the class was visiting Sacramento and learning about ag policy. Charizma is a member of the 2016 Agriculture Leadership Class. Charizma has been assigned two main projects this semester that will help the CCFC and Certified American Grown advance their respective missions. For the CCFC, she will be helping us prepare for next year’s Rose Parade. That may sound early, but the Cal Poly students are already making their decisions on next year’s float design, and the CCFC continues to advance its efforts to bring more CA Grown flowers to the Rose Parade. Charizma is excited about the task and the difference it will make in helping us achieve that goal. Charizma will also be helping us coordinate a resource kit for our Certified American Grown flower farms. We have some great ideas and examples to share with our farms on how to further their promotions with Certified American Grown, and Charizma will be packaging these all up for delivery to our Certified farms. Her enthusiasm is contagious, and we’re excited to have her on the team. She’ll be making calls, reaching out to farms and helping us accomplish these important projects. I hope you get to speak with her while she is with us. Safeway floral departments throughout Northern California have turned blue just in time for Valentine’s Day. A new Safeway floral department display in Northern California uses blue buckets to feature and help consumers identify flowers that are grown in the Golden State. Yes! The Northern California division stores are featuring all of their California Grown Flowers by displaying them in blue buckets. In addition to some point-of-purchase signage, the buckets help customers quickly identify which flowers are part of their CA Grown offerings. The blue bucket display featuring California Grown Flowers will continue through next week’s Valentine’s Day holiday. This show of support (and supply) for California Grown Flowers in Safeway’s Northern California stores isn’t unusual. Representatives from the Nor Cal region report that their department is generally stocked with anywhere from 50 percent to 75 percent California Grown on any given day. The blue bucket display, combined with the beautiful “CA Grown” posters, really do a great job of connecting the dots on the importance of the origin of flowers for consumers to consider before Valentine’s Day. It probably helps sales, too!